Prices for Catarata Del Toro and Blue Falls of Costa Rica. Opening hours: Monday to Saturday 07.00 – 17.00 hours, Sunday closed. Our parking lot is safe and secure and it is free and taxes are included. For more information and reservations please contact us. If you think you have seen it all and did not see Catarata Del Toro then you have not seen anything! The first trail is a self-guided tour all the way to the bottom of the most impressive waterfall of Costa Rica which is second to none in beauty and splendor. It throws itself 90 meters into an old extinct volcanic crater. First 500 meter of the trail is flat and has several fantastic lookouts and the second part is also 500 meters with steps with high impact. Therefore, people with heart conditions or any other medical condition, elderly and pregnant women should not go down. And for the rest of the people they need to take their time coming back up. The 350+ steps are safe and partly made of concrete and it has several sitting areas and views are incredible. Duration 90 minutes including the forest and garden trail and age 4 – 75, weight is medium and reservations are not needed. An easy hike brings you to the edge of the crater from where you easily spot the waterfall from different angles. Besides that, the trail goes through a primary forest with some nice trees, with a spectacular view of the canyon and the national park. Make a walk in our ever-under-construction-bird-garden which has been designed to attract birds and all kind of animals. Duration 45 minutes with no age restrictions, weight is easy and reservations are not needed. The guided tour starts at Catarata Del Toro, from where we walk 1.5 km to the most far point. Access is very easy as we will cross a river by a bridge and walk through the farm to the blue river itself, called Quebrada Gata. There are some metal steps to give you easy access to the two waterfalls called Las Gemelas. For the moment, the tour consists of Las Gemelas, the rapids and a nice blue pool where you can take a cold swim. Total tour will take up to 2-3 hours and the minimum age is 10 years and it should be dry for at least 24 hours else tour cannot be guaranteed. Reservations not needed. 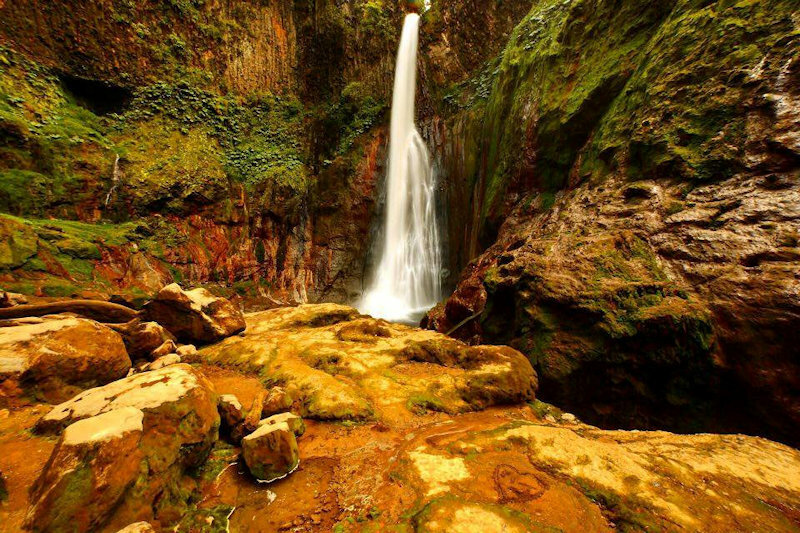 This pretty extreme tour is also with a tour-guide and starting point is also Catarata Del Toro but only for healthy people who are in extremely good physical condition.Duration 5 – 6 hours and the minimum age is 18 years. Swimming allowed and it should be dry for at least 24 hours else tour cannot be guaranteed. Reservations needed. Includes from 08:00-17:00 hours the use of a reserved part of the restaurant, electricity, lunch, unlimited coffee and entrance to trails and the waterfall. Also, reservations are needed. We only can offer this to one group a day and with a maximum of 3 setups at the same time. Minimum persons: n/a and maximum persons 15, who have to rotate in sessions and you have to bring your own leader, teacher or instructor. The park is closed for the public on Sundays but not for the ones staying in the rooms however, the Blue Falls will be closed for everybody. Room price includes entrance to Catarata Del Toro and breakfast, And bookers for 2 nights or more receives also the Blue Falls – Light. Check-in 13.00 hours and check-out 11.00 hours. Cancellation policy: minimum 24 hours in advance: 95% refund, same day or ‘no show’: 0% refund and reservations are needed. Offering breakfast, coffee, natural juices, sodas, snacks and paninis. We will send you an invoice by internet or ask for our bank accounts to make a transfer.